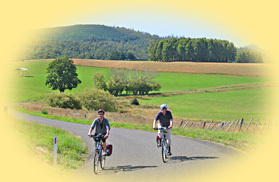 We were the first Tasmanian operator offering pure bicycle tours using our decades long experience obtained in Europe. Our tours are touring style -neither roadracing nor off road- and suitable for all adults with a bit of biking experience. We are located along the cycle trail what results in plenty of local knowlegde. Our tours can be modified to customer wishes; different accommodation options are also available. Please note the shortest tour we offer is 5 days long. - Self-guided tours Cycle alone or with partner/friends. Our detailed roadbook does provide all information. - Supported group tours Usually on demand only, for groups from 2 to 12 participants. However, we currently have some confirmed departures which are open to the public, see below. - Bicycle rental only We even deliver our bikes to selected locations and can provide waterproof panniers. Our business is independently quality approved by TICT. In March 2016 one of our guests cycled from Evandale to Hobart. Here his detailed blog . On 16.3.2013 our Guided East Coast Tour was listed within the "Active" section of 52 Extraordinary Australian Journeys in the Sydney Morning Herald (a leading Australian newspaper). Our business has been featured on Australian television in a travel show called "Eat Play and Stay". You can watch the clip when you click on the "as seen on TV" logo.